Experience elegant dining on the rails as it was during the golden age of rail travel in the United States. This enchanting two hour and fifteen minute ride through the beautiful Des Moines River Valley features historic 1950’s passenger cars used on the Union Pacific Railroad’s famous “City of Los Angeles” and “City of San Francisco” streamliners which traveled between Chicago and the west coast. This train crosses the 156′ tall Bass Point Creek High Bridge, as well as the Des Moines River, on its journey through the scenic Des Moines River Valley. After passing through the old coal mining town of Fraser, our dinner train climbs its way back out of the river valley on an impressive grade. We will make our way across some of Iowa’s rich farmland, eventually making our way to the end of our line at the unincorporated town of Wolf. At Wolf our crew will make preparations for the trip back down the hill, and soon we will begin our return trip to the depot at Boone. All meals are served with dinner rolls, a beverage (Coke, Diet Coke, Sprite, milk, coffee, or tea), and the Chef’s choice of dessert. Are restrooms available? Yes, restrooms are available on the train. Are reservations required? Yes, prepaid reservations are required. Are reservations required? Advance, prepaid reservations are required. Seating is limited. Call early to avoid disappointment. Generally, we recommend booking your trip at least one month in advance. During the months of September through November, we strongly recommend booking at least three months in advance. Can I pay with cash when I get there? Unfortunately, no. Prepaid reservations are required. We accept Visa, MasterCard, or Discover. When will my credit card be charged? Your credit card will be charged at the time you make your reservation. Will I receive my tickets in the mail? All dinner train tickets are held at the depot ticket window for pick-up on the evening of your trip. You will be mailed, or e-mailed, a confirmation letter, which you will need to present that evening at the ticket window. When do you need to know which meals I would like? You must provide us with your meal choices at least seven days prior to your trip. 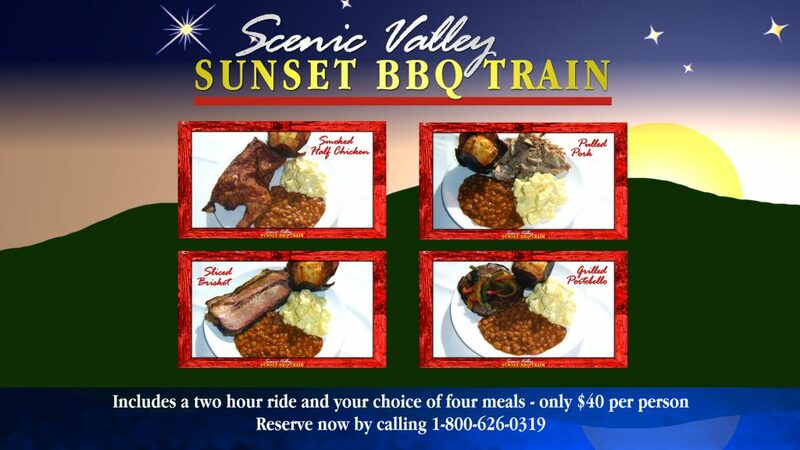 Seating: Dinner trains utilize assigned seating. You may be seated with another couple. When ordering, indicate if you would like to be seated with a specific party. Dinner train passengers are seated at tables of four people. For those wishing to have a more intimate dining experience, a private compartment may be available ($50 fee). Only two compartments are available on any given train. Be sure to inquire at the time you make your reservation! Is there a strict dress code? Although many men choose to wear a suit or sport coat, they are not required. We do request a “Nice Casual” attire, such as Dockers and a nice shirt or sweater for the men and slacks and top or casual dress for the ladies. This is your evening to relax and enjoy yourself, but it should also be special. When do we need to be there? Plan to arrive by, at the latest, 5:00 PM (4:30 PM in February and November), as we will begin to board the train at that time. Arriving on time will allow you time to pick-up your tickets, and give us a chance to review important trip information with you. Also, keep in mind that in excess of 60 freight trains pass through Boone on any given day. This frequently leads to travel delays for our customers. Your punctual arrival helps to ensure you won’t be caught on the wrong side of the tracks as your train departs our depot. Is smoking allowed on the train? Smoking is not allowed. All Boone & Scenic Valley Railroad trains, buildings, and grounds are smoke-free. May I bring wine? Although the Boone & Scenic Valley Railroad & Museum and our caterer are not licensed to sell liquor on the train, each couple may bring one bottle of wine to enjoy with their meal. A corking fee of $5.00 per bottle will be applied to your order. This is a requirement of our insurance company. Corking fees need to be paid prior to the date of your ride. Please “check” your wine at the ticket window upon arrival at the depot. Other alcoholic beverages will not be permitted. Our own “Scenic Valley Red” and “Whistle White” are available from our gift shop. For more information, call 1-800-626-0319. What if I need to cancel my reservation? Cancellation notifications and date change requests must be received at our office at least seven days prior to the ride. Cancellation policies are strictly enforced. What if inclement weather is predicted on the day of my trip? Our trains operate rain or shine. The decision to run is based on actual weather conditions at the railroad. If the train runs, no refunds or adjustments are made. If a train is cancelled, a gift card will be issued – no cash refunds. Are the cars heated and air conditioned? Yes, the cars are climate controlled. Is the train handicap accessible? Unfortunately, stairs, narrow hallways and other limitations make these cars inaccessible to persons utilizing wheelchairs, motorized scooters, etc. How much do tickets cost? Tickets are $67.25 per person (all ages). Will we cross the Kate Shelley High Bridge? The Kate Shelley High Bridge is located on the Union Pacific Railroad’s mainline across Iowa, which is unrelated to our line. However, we do cross the 156′ tall Bass Point Creek High Bridge, which is the highest single-track interurban railroad bridge in the United States. If you have additional questions, feel free to send an e-mail, or call us at 1-800-626-0319.